I’ve been thinking about celebrations. When good news happened, I used to make a small production out of it. Things that would force me to slow down and enjoy the moment. I’m talking happy dances, a night out with friends, etc. We don’t celebrate things like we used to. I’m not blaming social media entirely, but real-life is imitating social media. It’s much easier to share a post on social media about your good news. It’s easier to share via social media than to send a bunch of texts and/or call everyone. Once that’s posted, we move onto the next thing. There’s so much sadness around us. At times, it feels like it’s robbing us of whatever happiness we have. We need to replace that happiness. 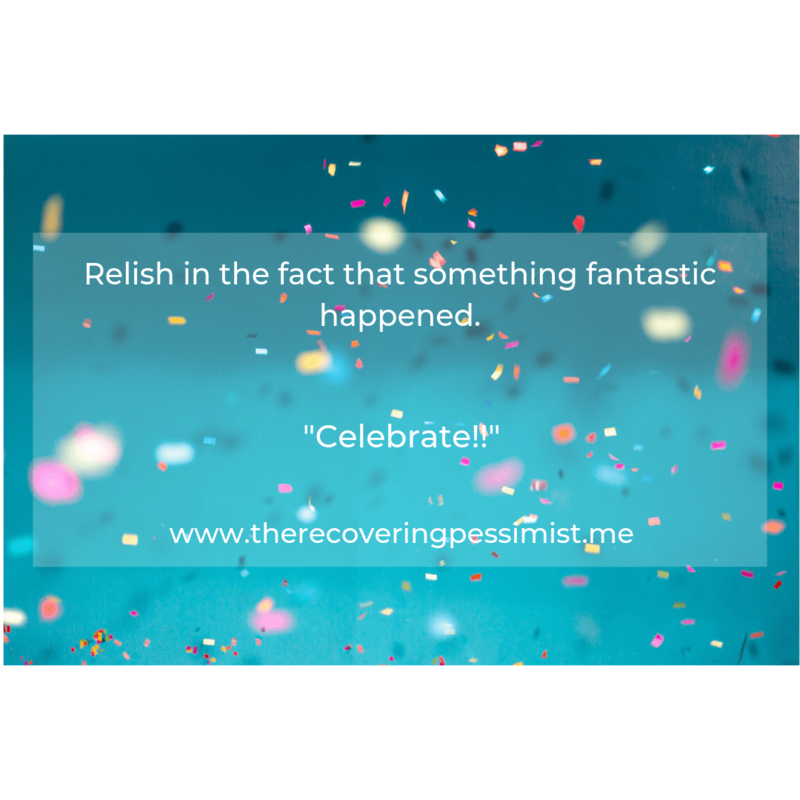 When we have moments that deserve a celebration, we owe an obligation to ourselves to celebrate. Doesn’t matter how big or small the celebration is. Relish in the fact that something fantastic happened. Something that you expected. Something you didn’t expect. Something you manifested, hoped for, dreamed about. Whatever it is, it happened…to you. I’ve had some bad experiences that left a bad taste in my mouth. It feels like when you burn your tongue and you swear you’ll never be able to taste anything again. Sounds familiar right? When others around me experience the things I’ve experienced and get better results, I used to feel a way. Bitterness with a sprinkle of jealousy. I felt split in half. I want to celebrate the moment(s) with them because I’m genuinely happy for them. But that other part of me can’t help but to rain on their parade via bitterness and jealousy. I had a Come to Jesus meeting with myself. I know how it feels to have someone rain on my parade, whether they meant to or not. It’s an emotional gut punch. I don’t want someone else to feel that way. Just because you're in your feelings doesn't mean that you project those feelings onto others. This isn’t about me. I should be celebrating someone’s accomplishments. I can wallow later. RVA (Richmond, VA) experienced a significant amount of rain over the past few months. It got so bad that we would go a week plus before we saw sunshine again. “Duh! Why would you even ask that? !” is my first response. But wait, there’s more. When you’re in the middle of the storm and the rain is falling so hard you can’t see in front of you, asking this question makes perfect sense. You want the anxiety to go away. You want your appetite to return. You want the headaches to go away. 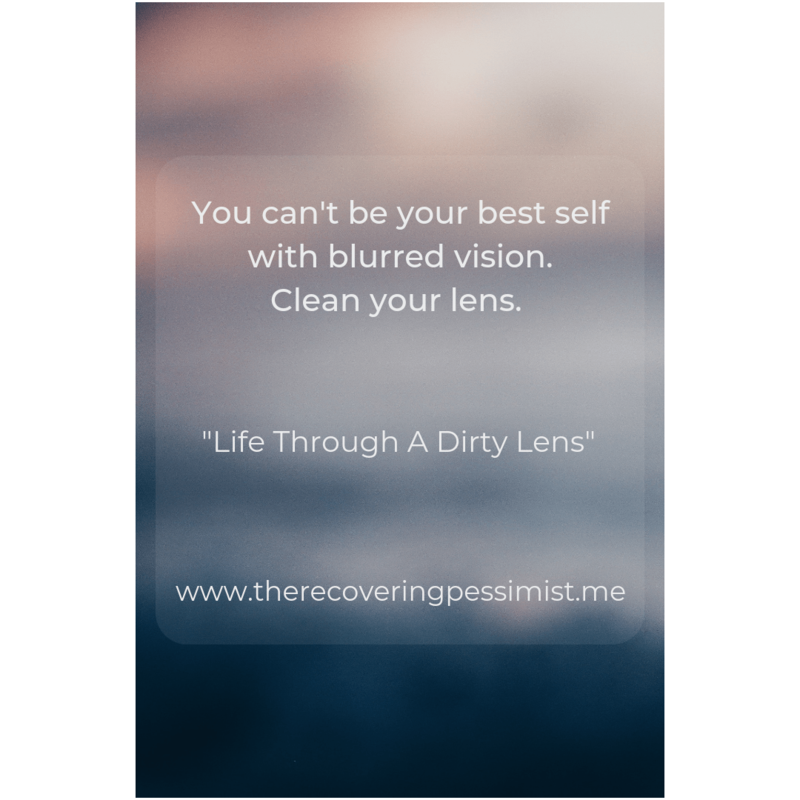 You just want to achieve your goal(s) & continue to live your best life. The next time you ask yourself if you can weather the storm, remember why you made the goal in the first place. You got this. 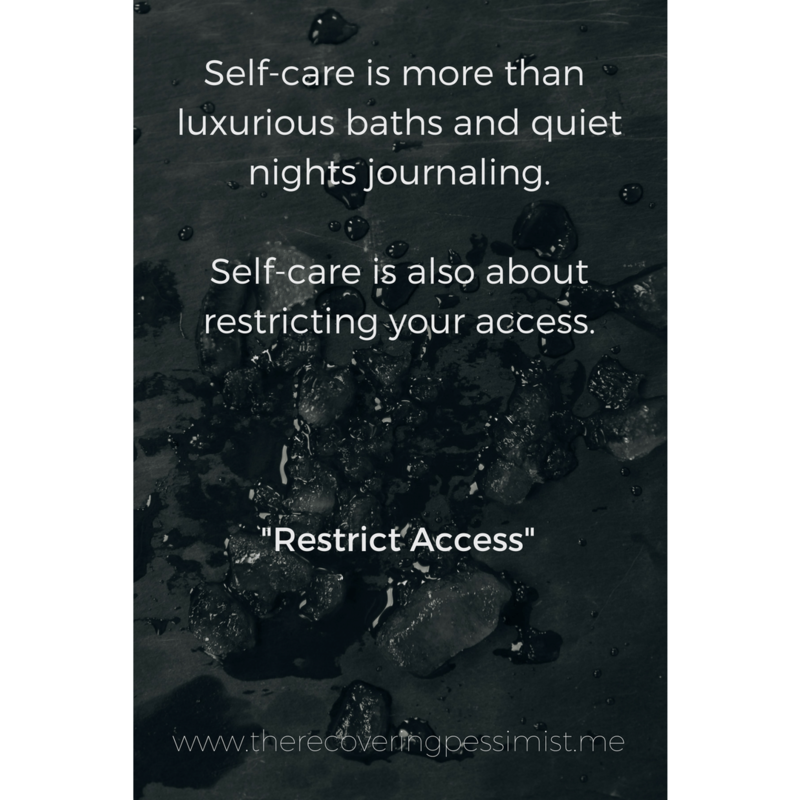 When I first learned about “self-care”, I thought about luxurious bath soaks, quiet moments reading/journaling, watching TV with wine, etc. As time went on, I learned that in addition to all those things, self-care is anything that improves your well-being. Fast forward to now. Recently, I was scrolling through my social media and noticed that I followed a few people who I no longer communicate with. Mainly because the reason (or reasons) that made me follow them online were no longer relative to me. 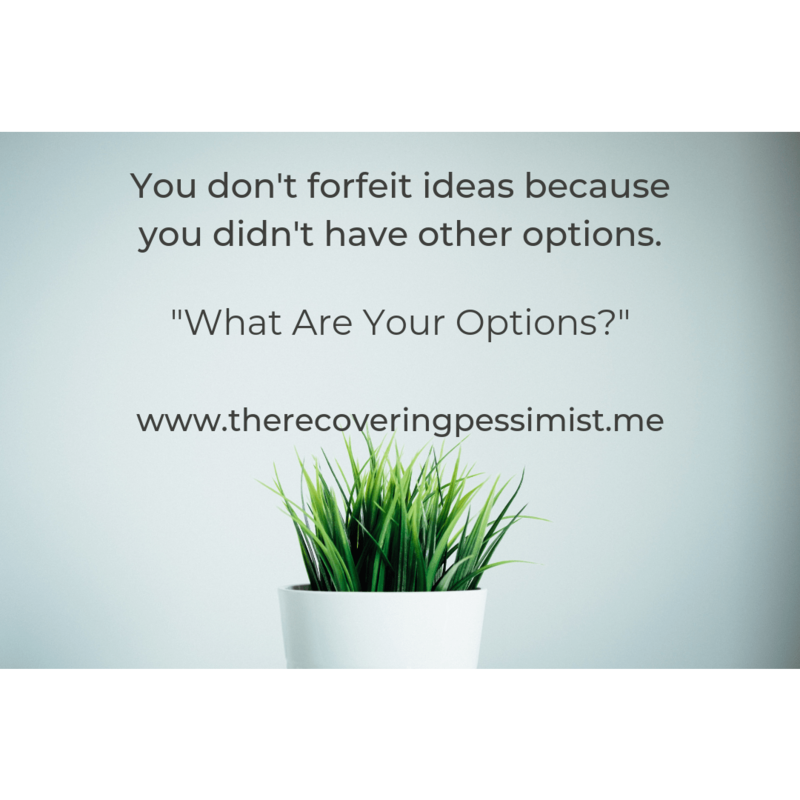 Then I had a lightbulb moment. Why do they need to have access to you online? There’s no need to keep people around, whether it’s online or offline, that no longer have a place in your life. Doesn’t matter if it’s a close friend or a relative. Self-care is all improving your well-being so why would you keep people in your life that don’t positively affect your well-being? Do what's best for you, including restricting people's access to you. A year ago, I decided to focus more on my creative writing projects. After much procrastinating, I created Snapshot Storyteller: an unglamorous and unconventional look into my writing journey (subscribe if you want to stay in the know). Right now, I want to spend time growing Snapshot Storyteller and working on creative projects. 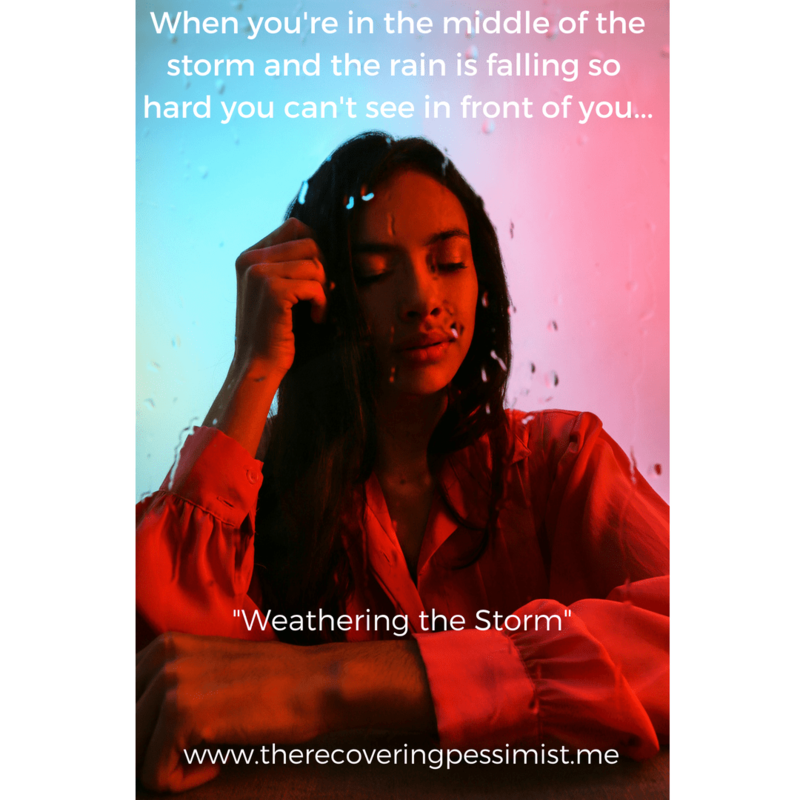 That won’t leave me with a lot of time for The Recovering Pessimist. As of today, the posting schedule will change. Instead of posting every Monday, I will post 1-2 times a month. Wisdom Wednesdays will still post weekly for the rest of this year. 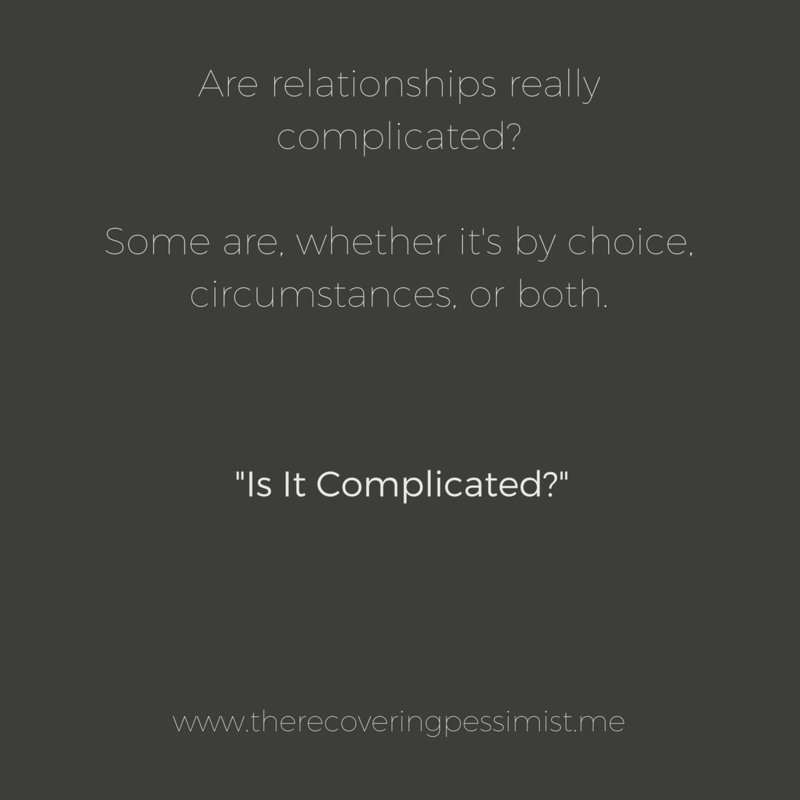 Is it complicated by circumstance? Is it complicated by choice? I decided to answer these questions based on my own observations. Things could be complicated due to lack of communication. If neither party expresses their expectations, wants, etc., the relationship itself will resemble a car when you take your hands off the wheel. The relationship will run smoothly for a bit but at some point, it will veer off the road. I’ve witnessed people in relationships voluntarily engage in BS for the sheer delight of relishing in chaos. I’ll never understand it, but that’s not my battle to fight. The idea of enjoying a healthy relationship just isn’t appealing to some. I guess that’s okay. Clearly folks like making a mountain out of a molehill. Are relationships really complicated? Some are, whether it’s by circumstances, choice, or both. What won’t make them any less complicated is letting everyone know that your relationship is complicated. No need to make something more difficult than it is, right?